Father and son, Paul and Brian Stephenson, congratulate one another upon graduation. With a combined total of five bachelor's degrees, three master's degrees and a PhD, there's no question that education is a big deal to Kelowna couple Paul and Jennifer Stephenson, and their two children, Brian, 21, and Sarah, 25. And although each graduation was a celebrated family milestone, today holds a special significance, as both father and son walked across the stage on the same day, during the same graduation ceremony. "I've walked the stage before as an undergrad and grad," says Paul, who received his PhD in Interdisciplinary Studies. "But to be involved in the same ceremony as my son, well, I have a huge amount of pride and appreciation for the experience. It was quite emotional." 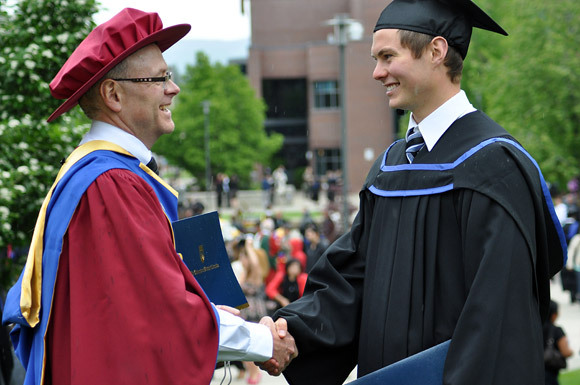 Paul and Brian, who earned his bachelor of arts (honours) degree in history, join Jennifer and Sarah as UBC alumni, making UBC a family affair. Jennifer received her master of rehabilitation science (MRSc) degree from UBC through an online program in November 2010, while Sarah was awarded her BA in 2009, and is currently working on her Elementary Teacher Education Program (ETEP) at UBC's Vancouver campus. "For my sister and I, going to UBC in Kelowna meant we had the chance to live at home, eat mom's cooking, save some money and get a meaningful degree," says Brian. "It made the transition to post-secondary easy." For Paul and Jennifer, the decision to pursue graduate studies at UBC was based on a combination of factors: timing, location and accessibility of programming. "I had wanted to get my PhD for years, but when the kids were young I didn't want to leave my family," says Paul. "But when UBC's Okanagan campus was established, I thought to myself, 'this is it; this is my chance.' "
At one point, all four family members were enrolled at UBC. "There was a period for a while when the TV was never on. There was so much work to do. The kids would go to their bedrooms; Jennifer and I would go to the study. We had separate desks on opposite sides of the room; our house was like a library," says Paul. However, he believes student life actually brought the family closer together. "Being students helped us relate to each other," says Paul. "Lifelong learning was always something Jennifer and I tried to inspire within the children. To me, if you're always excited about learning something new – just for the excitement of learning it – you never get tired of what you do. "Learning is a way of staying excited, and really, a way of keeping a young outlook on life." Brian echoes his father's sentiments. "I see education as a way to constantly challenge yourself and expand your boundaries. Variety in knowledge makes you more of a robust person, I think." This fall, Brian will keep the family tradition of education going strong. He is continuing his post-secondary pursuits at UBC’s Vancouver campus, where he's been accepted into the law program.